No trees for that hammock? No problem. This is irony: I’m a hammock camping fanatic, surrounded by the largest contiguous Ponderosa Pine forest in North America, yet I moved into a neighborhood devoid of trees. My entire 2-acre lot is barren, and while I’ve planted a few trees, it will be years before I’ll be able to hang anything more than a bird feeder. To make matters worse, I live in the American Southwest, a region known more for red rocks and sand dunes than forests and trees. I’ve learned many (often expensive and even painful) lessons during this “collection” process. First, most traditional backyard spreader bar hammock stands are not designed for most camping hammocks, nor are they engineered to accommodate a tarp. Some portable hammock stands are simply too heavy and bulky for anything but car camping, and some stands are too complicated or require unique handling to work correctly. Other portable stands require significant anchoring (and more real estate) to work properly, while others are free-standing. Good or bad, some of the best stands for camping hammocks are do-it-yourself projects, some more complicated to construct than others. If you’re comfortable with do-it-yourself projects and have the necessary tools and know-how, these stands can be a fun to make. But don’t let the “DIY” label scare you — some of these stands can be assembled without any tools in just a few minutes. Is it truly portable (e.g., it can break down and fit in my sedan)? Is it easy to assemble in the field (especially with just one person)? Can it accommodate a tarp without flexing? Is it structurally sound and sturdy? Can it hold more than one hammock? Items one through three are arguably very subjective. What you can afford in terms of cost, assembly time, and transportation are as variable as the user. I’ll argue that items four and five are mandatory, as you don’t want to compromise your health or safety with a stand that fails or cannot hold a tarp taut in severe weather. Number six is a bonus item, and not often applicable, but it’s handy if, like me, you often camp with friends or family. The following list of stands isn’t meant to be exhaustive and is not ordered by any means, but it illustrates some of the options that fit my criteria, within reason. Do you have a hammock stand that you prefer that’s not on this list? Let me know in the comments. Portable: Breaks down into six pieces that can fit into a trunk with the back seat down. Six ft (1.8 m) pipe lengths. Packs down flat. Field Assembly: 1 person. Moderately easy. Steel components are heavy. I leave the “feet” assembled for easier assembly. Affordable: $180 depending on pipe size, etc. Fits a tarp: Yes. This stand is just over 12 ft (3.7 m) long and fits most hammock tarps. Sturdy: Very sturdy. All-steel construction. Make sure all fittings are tight. Comments: This is the stand I use when I do hammock demonstrations. It’s car portable, easy to assemble, and doesn’t flex. I was able to buy the parts from a local hardware store and build it without any special tools within a few minutes. Portable: Breaks down into five pieces that can fit into a trunk with the back seat down. The legs are the most cumbersome as they don’t lay flat. Field Assembly: 1 person. Easy. Steel components are heavy. Fits a tarp: Yes. This stand is adjustable and you can even buy an extension adapter to go really long (up to 180 in/457 cm). Flex: It does flex, although less than most backyard stands. Sturdy: The Vario is steel and very solid. The only weak points are where the screw knobs connect, but when properly fitted, there is no worry over construction. Portable: Breaks down to as few as three pieces that can fit into a trunk with the back seat down. The tripods can be built in a variety of ways for easier storage, but most use long struts. Field Assembly: 1 person. Easy. Fits a tarp: Possible. Depending on how you build this stand. The top rail is the limiting factor on whether a tarp will fit over the hammock. Sturdy: To improve the structural integrity, some folks recommend adding a rope around the base of the tripods to prevent them from flaying outward. 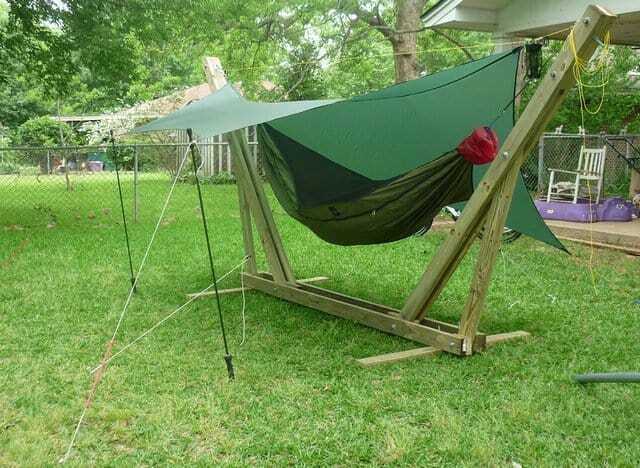 Comments: This is one of the more popular do-it-yourself hammock camping stands, probably because it can be built in the field if materials are readily available. The rigid top rail prevents the stand from flexing, making it possible to hang a taut tarp above the hammock. This stand can be constructed a variety of ways, including using wood/bamboo struts with a tripod lashing and a top rail, or using hinges, bolts, and steel beams. Hennessy Hammock patented a variation of this stand that they’ve used at multiple Boy Scout World Jamborees. The beauty of this tripod-based stand is that it can grow to accommodate multiple hammocks, creating a hammock village. Portable: Requires tools to unfasten bolts, but can be disassembled into as few as 3 pieces. Some can fold into just one piece. Fits a tarp: Possible. Depending on how you build this stand. Longer stands will support tarps better. Sturdy: Sturdy construction, depending on materials used. Comments: A lot of people have gotten very creative with fencing pipe, poles, and wood struts, creating hammock stands to suit their own needs. This is one of the more popular examples using construction materials to assemble the stand. The 2×4 stand can be built to fold down and then carried in the bed of a truck. It’s not as portable than other stands due to its pack size and weight. Portable: Folds up and is backpacker-friendly. Field Assembly: 1 person. Moderately easy. Fits a tarp: Possible. The struts can be pulled apart to accommodate a tarp. Sturdy: Very sturdy. Uses tensegrity to maintain structure. Requires good staking. Comments: This is the only backpacker-friendly stand on the market. At approximately 1 kg, this stand can be easily portaged, carried, and packed to nearly any destination. For beaches, Handy Hammock sells longer “beach stakes” that keep the stand sturdy in soft sand. For more photos and modifications, check out my Handy Hammock review. Portable: Breaks down to three struts, rope, and stakes. Hard to fit in a sedan trunk. Field Assembly: 1-2 person. Moderately easy. Flex: Slight flex, depending on rope used. Sturdy: The design is based on tensegrity, which channels compressive forces through the struts. It is remarkably sturdy. Comments: I used the instructions from bweebweebwee.com and found the design to be rock-solid, even with cheap rope. This stand takes up a good amount of real estate, but it is a great center piece at a camporee and can double as a group kitchen area and lounge. This is the only stand that can easily accommodate more than one hammock by design. Portable: Breaks down to two struts/pipes, rope, and stakes. Can be hard to fit in a sedan trunk if the struts are too long (put the seats down!). 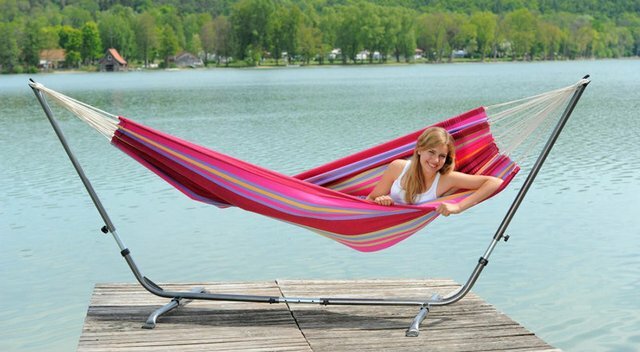 Sturdy: The design is similar to the Handy Hammock design but the force distribution varies depending on construction. Comments: This is a fairly simple design, but solid anchoring is very important. If the design is tweaked so the struts are at a 60-degree angle, more compressive forces are placed on the struts instead of pulling directly up on the stakes. This anchored pole design can be used when you only have one tree or support to anchor your hammock. A commercial variation of this is the Byer of Maine Madera stand (below). It uses two struts and one tendon/anchor, but it works much in the same way. Let me reiterate the importance of good anchoring with these stands. Depending on the angle of the strut/pole, you can exert more load on the anchors than they are designed for. I recommend getting 2 ft (61 cm) or longer rebar as stakes and pounding them in at a 60-degree angle away from the struts for maximum support. Portable: Breaks down to three (or more) strut/pipe sections, rope, and stakes. Can be hard to fit in a sedan trunk if the struts are too long. Field Assembly: 2 person. Moderately challenging. Flex: Slight flex, depending on rope/”tendons” used. Sturdy: Tensegrity can be very strong and sturdy, but this stand is not exactly “free-standing” in every respect and requires stake-outs, especially if only one person is hanging. Comments: This is one of those physics-defying stands that doesn’t look like it should work. When I first saw it, I had to try it. I will say that this stand is complicated to build. There are much easier stands to construct and assemble in the field. However, this one gets a lot of “oh-my-gosh-this-is-cool” points, even if it takes 30+ minutes to finally assemble. When this design was first attempted, a lot of people wondered if it would be free-standing. In practice, it isn’t. The stand requires some good anchoring to prevent tipping, especially with one occupant. I tried making this stand using sections of fence pipe. The fence coupling I used wasn’t strong enough and eventually bent, collapsing this stand on top of me. If you use pole sections, be sure the sections have strong couplings and do not bend. Derek Hansen is a lightweight backpacker, Scoutmaster, and “hammock enthusiast” who enjoyed his first hammock hang at age 14 at a Boy Scout High Adventure base. Derek rediscovered the wonders hammock camping 16 years later in Virginia, and has been avoiding the ground ever since. Derek maintains a blog on hammock camping and lightweight backpacking at TheUltimateHang.com, and is the author/illustrator of The Ultimate Hang: An Illustrated Guide to Hammock Camping. I don’t have any trees in my backyard, and I’m not looking for a DIY project. I may want something I can “tear down” and bring in the car. I’ve been doing a little research on some stands I found locally. If it helps I’m planning on buying a eno hammock, or therma-rest around the same time..
What is the difference or advantage(s) between 9ft and 12ft? It that for different type hammock (camping/brazilian), or to accommodate a larger person (I am only 5’8″)? Why do some come with a hook, and others with a y? does it matter which one I buy? I bought one and have been happy. Wow I had no idea that there were people out there that loved hammocks as much as me. I slept strictly out of a hammock for two years while I lived in the yucatan peninsula. I’m sorry friends, but they make the best hammocks in my humble opinion. I love the research you have done! I think I like the portable pipe or the Byer of maine vario stands. I want something that comes apart and can put in the back of a car or truck. If anyone has any other ideas i would love to know! Handy hammock – what’s the difference between the handy hammock and th handy hammock with connectors and shackles. I’m new to the hammock camping world and not sure which one to buy. I have an Eno hammock also so will be multi use. Thanks! Wow, you have some great info here! I have been in search of a portable hammock stand for years. I was just car camping at yet another State Park that doesn’t allow you to fasten anything to the trees. I just saw the Tato Gear Hammock Stand Kit with the Metal Pole Option. Not sure yet how long the electric conduit will have to be, but with their available Rail and Leg Extension Plugs, I should be able to cut them to a manageable size. Using a 9′ Hammock Bliss, 165 lbs. Also curious about proper distance between posts. The whole set up should come to 25-30 lbs. The kit is a little pricy, but if it works well, then it’s worth the price. It would seem to meet my other specs of needing no anchors points, packable, easy to set up…age creeping up, losing strength, and arthritic fingers. Find or make some stuff sacks, and I’ll be set for the next outing…if my son doesn’t commandeer it for his Eno. Have you seen this product yet? Yes, I’ve seen it. He has a 2×4 option and a conduit option. I think the 2×4 would be less expensive and even lighter (perhaps). If you want to hang a tarp too, you’ll need at least 12 feet between the stands. As an FYI for the DIY crowd I took a DIY EMT Conduit stand I saw an archived thread over at the hammock forums and put my own simple tweaks on it and resurrected an old idea. Several of us have made the stands and they are working great. I am very intrested in the portable hammock stand. Would like to know the price and can it be courier to Rustenburg. Is the shop in RSA? Any new info on the eno roadie Hamock stand? Not much on the stand yet? I just got an eno solopod for my eno dn. works great, very sturdy, very,very heavy, but will live in my back yard where I sleep several nights a week. This is a very good,but expensive stand. My previous stand was made from two 6′ 2″ diameter bamboo poles that were pegged out with 18″ steel “homey D” construction stakes. I used marine anchor line with a ridgeline that held everything in place even when the hammock was removed.The poles were 12′ apart. I also had a smaller, 4.6′ set of bamboo poles, and used amsteel whoopie slings for the stake outs. The distance between the poles is based on the length of your hammock, which is attached to each pole by endless loops larksheaded around each pole.The hammock is attached with biners. use real ones. Very portable, but you still need those heavy stakes,and a sledge to drive them in. At the beach you can bury hubcaps in the sand in the place of stakes. Much lighter and just as strong. Here in Florida bamboo is everywhere so the rig is cheap and lasts for years… It also looks really cool. Probably stronger than the handy and way cheaper. Here’s a neat little variation on some of the ideas above — I’ve not tried building one myself, but I’m considering it for my next cycle tour…. Or just hang from both trees (off to one side) and put a 6 foot pole up to raise one end of the hammock back up. A single tree hang, with the second tree acting as anchor for your pole. What do you folks use for stakes??? I’ve tried and failed with those screw in dog tie outs? Here’s a vote for the turtledog stand. Fits in my Toyota, easy to set up, solid, handles a tarp well, needs no stakes, height adjustable, fun to make. I am interested in your portable hammock stand. How much are they? I already have a hammock so I only need the stand. I have built a turtle dog, pipe stand and a variation of what you call the “anchored pole stand”. The pipe stand is by far my favorite (and most costly). The pipe stand and calculator works great for my Hennessy. if you hit the big box stores and buy 10′ sections of black pipe, they will cut them to desired length and thread for no additional charge. Ends up being much less expensive than buying smaller lengths. You can use the small leftover pieces as the “feet”. I went 14′ for anchor distance and used the 66.5″ height to fasten the Hammock and the 21.9″ suspension length. Fastened two large carabiners to the 90 degree elbow.